HMS Calliope was the flagship of the 4th Light Cruiser Squadron and directly attached to the Grand Fleet. In command was Charles E. leMesurier, John LeMesurier’s father. 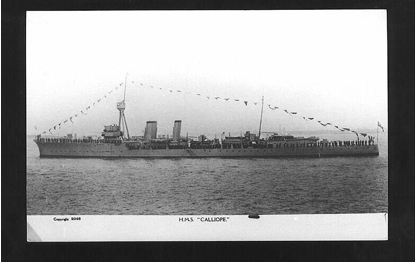 Calliope was to be very heavily engaged in fighting back the German torpedo attack that led to Jellicoe’s Turn Away. She was hit three times and around a dozen men killed. Many years after the battle (actually in 1932), Jellicoe later wrote that he should have used the 4th LCS more effectively, particularly in the scouting actions when contact had been lost. Sir James Spooner’s father had been at Jutland on the Calliope as a Lieutenant. He was later awarded a DSO in 1919 and promoted to Captain. . He had gone to Wilhemshaven and had heard about the extensive damage that had been suffered by the German ships. Later, in 1920-21, he was chosen as the Navigating officer on HMS New Zealand when Sir John Jellicoe later made his Dominion Tour. He’d been a great fan of the Admiral. 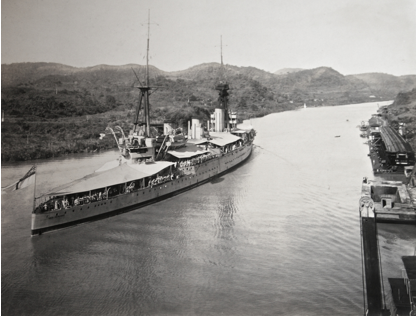 HMS New Zealand in the Panama Canal. Part of the Dominion voyage 1919. In Gaillard Cut (Kindly submitted by Sir James Spooner who had been a friend of my father, George).